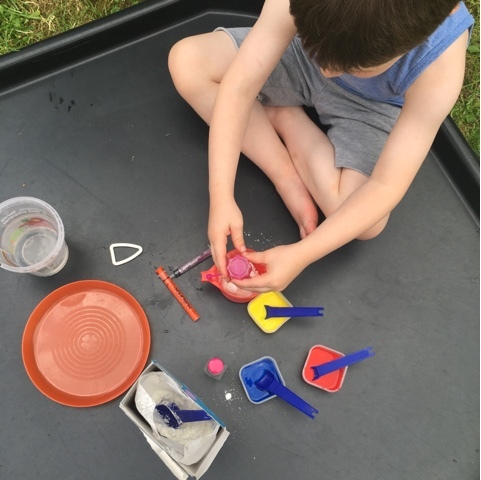 Sometimes it’s the super simple activities that are the most popular and teach your little ones without them even realising. This tuff spot was one of those invitations to play. This started when T was watching his Dad mix some cement to fix our shed! 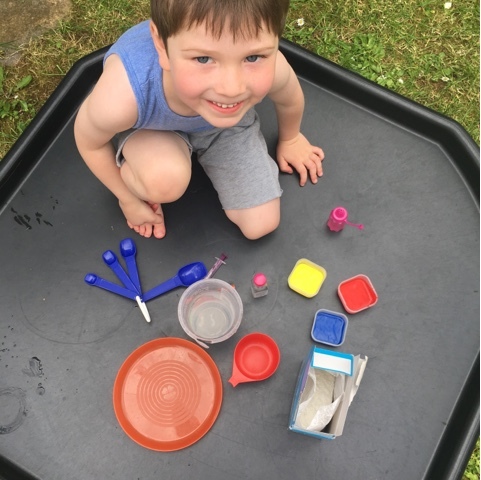 He was absolutely fascinated by the fact that the water and cement mix made a solid mixture. He asked if he could have a go and I said I’d set up something similar for him to do. Little did I realise that this would last over 2 hours! 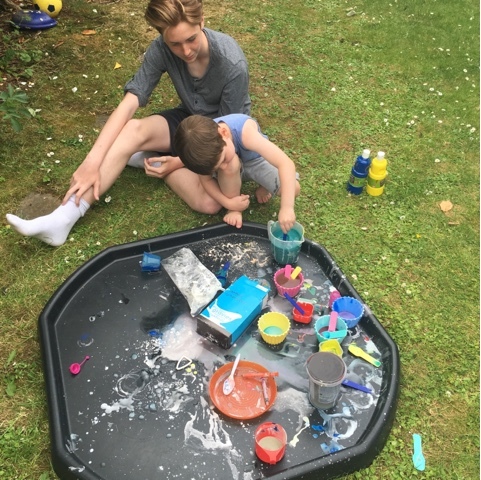 I started by adding water to some small bottles, squirters and providing some syringes along with a box of corn flour, paints in primary colours and mixing items like spoons and pots. 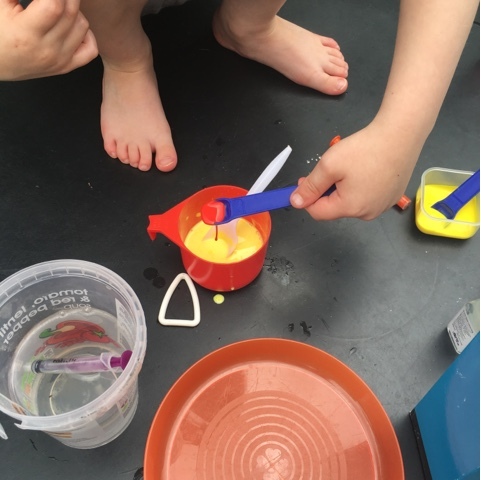 We started mixing some paint into the water and then mixing that with some corn flour. We talked about the secondary colours and how mixing primary colours made them. It didn’t take long before I could leave T to his own devices and leave him to do his own thing. 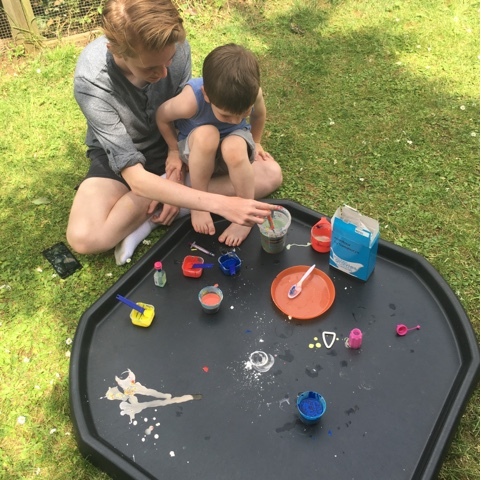 T then decided that he wanted his brother H who’s 15 to come and help and between them they came up with measuring how much water to add to corn flour to make the traditional oobleck mixture. Then how much of the primary colours were needed to mix a ‘perfect’ secondary colour. It was great seeing the boys working together, enjoying each other’s company and basically finding their own entertainment with such a simple tuff spot invitation. 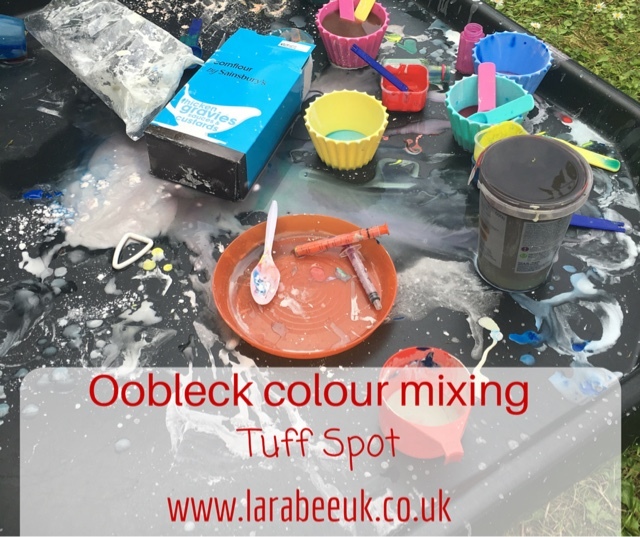 This is a lovely and, as you say, simple activity to get young kids engaged in both sensory play and learning. It's also so nice seeing your elder child taking a active role. My two *hated* oobleck last time I made it but think I might give it a go again - it's such a great activity! 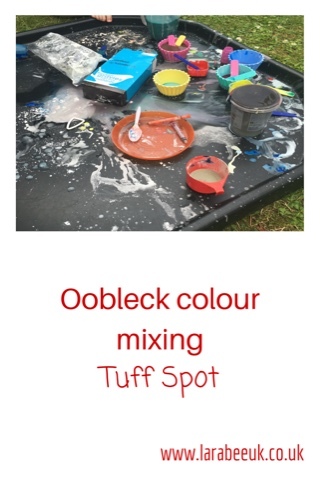 ooblek / gloop never ceases to amaze me. I think I enjoy it more than the kids! I love that even his big brother had to get involved. Thanks for linking up to #ToddlerApprovedTuesday.